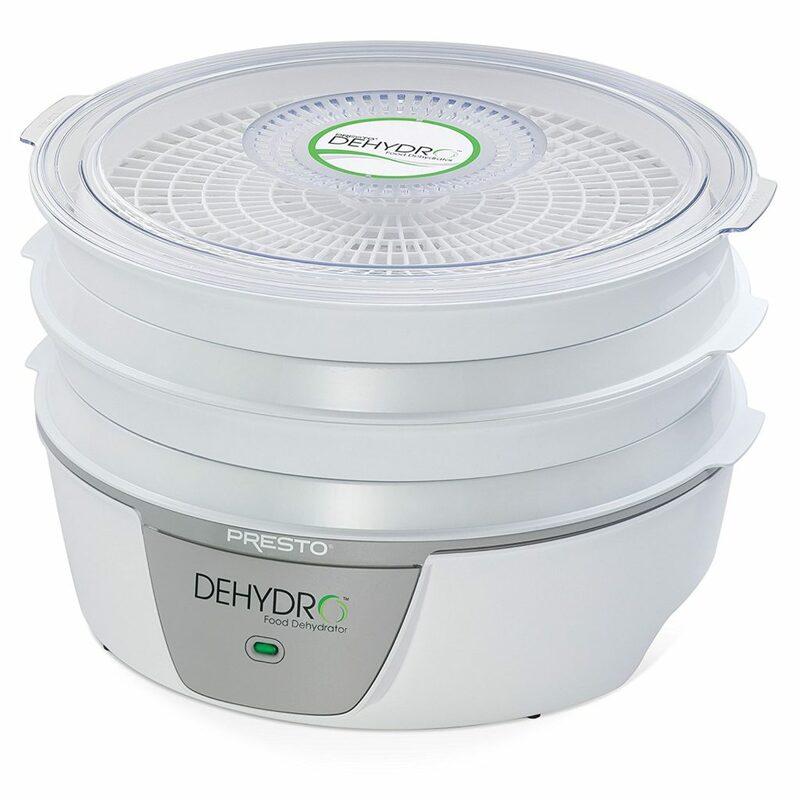 Presto 06300 dehydro electric Food Dehydrator Review - Any Good? A food dehydrator can offer endless possibilities from dried strawberries to kale chips, or your own beef jerky recipe. But many food dehydrators on the market are simply priced too high and just don’t work with your budget. Enter the Presto 06300 food dehydrator. One of the best selling points for this model is that it’s affordable and versatile. It’s a great buy if you’re new to food dehydrating and want to do a little experimenting with seasonal fruits and veggies, or if you’ve been looking for an affordable model that you can use to dry the herbs or flowers in your garden. Whatever you have in mind for your food drying experiments, this Presto model can handle it. This model is small and compact, about the size of a standard crockpot, so it’s pretty easy to find space to store it or you can choose to leave it on the counter. The dehydrator features a basic design and is pretty easy to use. With the stackable tray design, this model features four drying trays. The manufacturer also sells additional trays separately if you want to make bigger batches. This unit runs on six hundred watts of power and features a fan and heating element inside. The heating element is surprisingly powerful and can dry foods faster than you’d expect. With this dehydrator, you can dry pasta, meat, veggies, and fruit. The cover is transparent so you can peek in on your food during the drying process, which is helpful considering this model doesn’t come with a timer. Both the cover and the drying trays are dishwasher safe, which makes cleanup simple. You can also nest the trays inside each other, which will save you plenty of space. The cord can be stored in the base of the dehydrator. Presto also sells a variety of accessories that are compatible with this model including jerky spice kits, nonstick mesh sheets, and fruit roll sheets. Using the Presto food dehydrator to remove moisture from such food items as veggies and fruits will create naturally concentrated, delicious, rich tasting food. Not only that but when you make these dried goods yourself, you know the freshness and quality of the fruits and veggies you’re using, unlike when you purchase dehydrated foods from the grocery store. Unlike other methods used for food preservation, food dehydrators work to remove all the water content from food during the drying process. Because of this, the risk of the food spoiling or growing bacteria is very low. Dehydration is actually a food preservation methods that’s commonly used by hikers, survivalists, preppers, and campers because of the low cost and safe nature of the preservation method. With this food dehydrator, you’ll also never waste food again. You can use your leftover veggies and fruit in the dehydrator and extend their shelf life up to one to two years. If you’ve always wanted a bigger herb or veggie garden, but you were worried about some of your hard grown harvest going to waste, simply use this dehydrator to make veggies chips, or dry your herbs for later use. Some veggies that work great in this dehydrator include sweet potatoes, carrots, turnips, beets, and kale. Any dehydrated food can also be rehydrated by simply adding a little water or by adding fruit or veggies to sauces, stews, casseroles, and soups. You can also save quite a bit of cash at the grocery store. Store bought, processed snacks can be expensive, and most organic dehydrated foods you’ll find are often overpriced. You can save money by drying your own organic produce, buying fresh food items in bulk when they’re in season, or you can harvest your own fruits and veggies from the garden. If you’ve ever tried to use your oven to dehydrate food than you know how frustrating it can be due to uneven oven temperatures, not to mention the lengthier process that requires you to preheat the oven and the several hours it takes to properly dehydrate certain foods. If you enjoy dehydrating foods often then this can even lead to a higher electric bill. This small Presto model uses very little power and can dehydrate your food much faster. This type of efficiency and the easier cleanup is what makes this such a popular model. Whether you want to activate some nuts, make fruit leathers, or make your own batch of veggie chips, this food dehydrator will give you the flexibility you need to do it all, plus you can run this machine for several hours without heating up the whole house or causing your electric bill to skyrocket. Pros: One of the main reasons this model is so popular on sites such as Amazon is because it’s incredibly affordable. This lower price encourages curious consumers to give food dehydrating a shot. This machine is efficient and quick and because it’s so simple to use it’s perfect for novices and experienced users alike. This is a very lightweight model, weighing in at a little over seven pounds. Cons: One of the biggest drawbacks is that it doesn’t come with a timer, unlike the Hamilton Beach 32100A Food Dehydrator. This is a must-have feature for any dehydrator, so for some, the lack of this feature is a total deal breaker. The dehydrator also doesn’t come with a thermostat which can make it difficult if you’re big on making jerky, which is a process that requires constant high temperatures. The amount of noise the dehydrator emits is too loud for some users. Overall, for the price, this is a great entry-level food dehydrator, especially for people who will only use it occasionally. It’s also a good choice for beginners. Priced affordably, this easy to use unit is compatible with a wide range of accessories, which makes it more versatile, especially if you want to try your hand at making your own fruit leather.